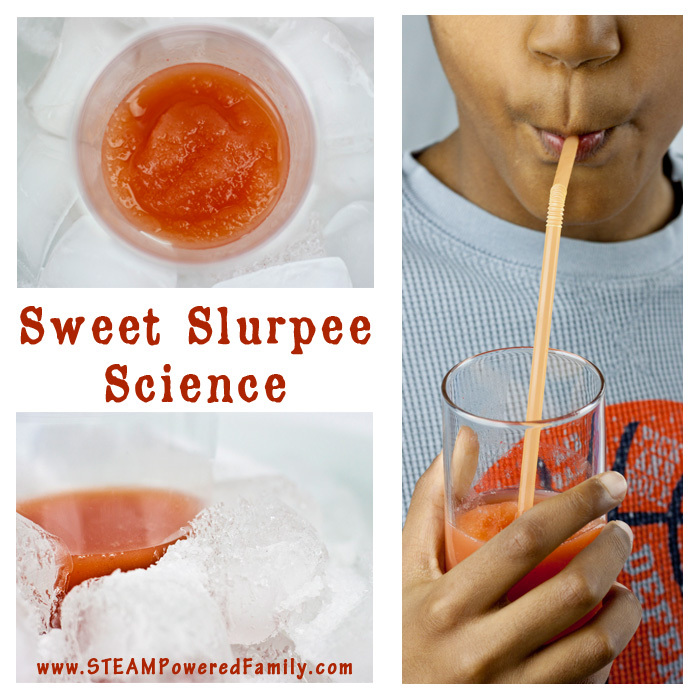 Sweet slurpee science is a fantastic activity for kids, with a tasty result they will love. 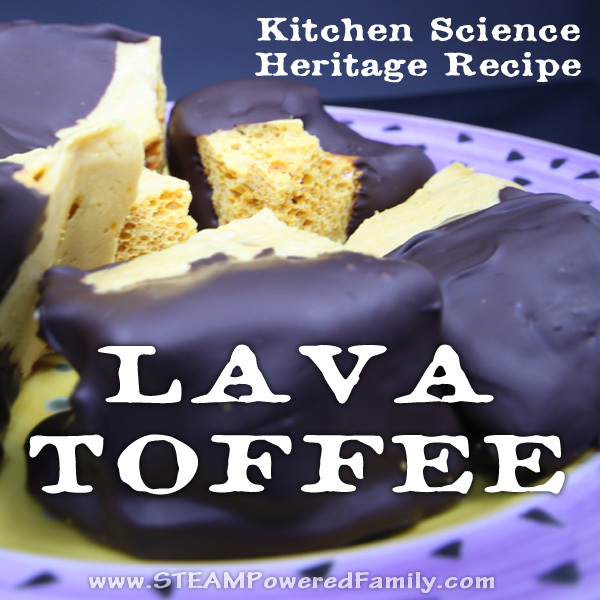 This simple heat transfer experiment is perfect for all ages. Do you love slurpees? My youngest is a slurpee nut! It’s -30 plus windchills here and he is still begging to go get slurpees. I love my boy, so instead of going out into the bitter cold to get these frosty drinks we made our own with some sweet slurpee science inspired by our Winter STEM Activity experiment! 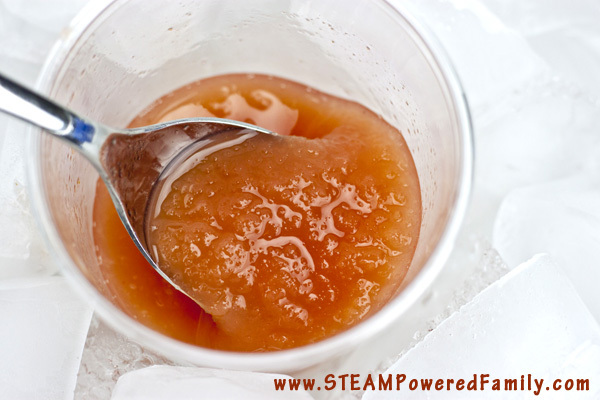 Juice – We used Guava Juice as a special treat and it was DELICIOUS! 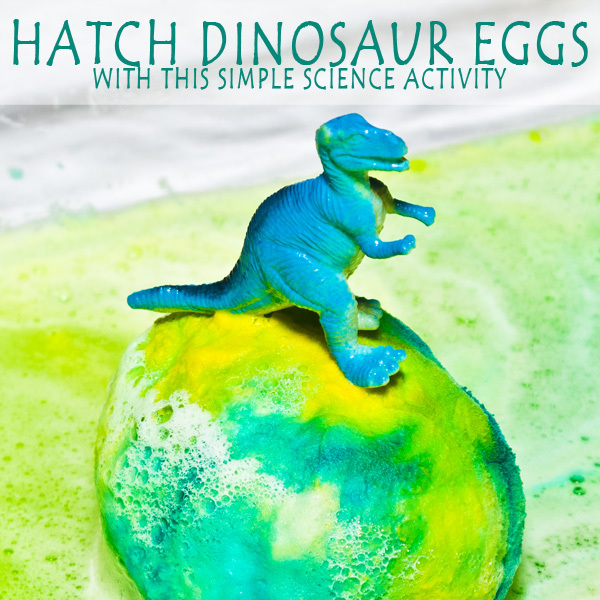 Now I’m going to be honest, this experiment is about as exciting as watching paint dry. That is until you can enjoy the fruits of all your patience waiting for the science magic to happen! I highly recommend you do this experiment when you have other things to do. It would be fantastic for a group or class to set up at the beginning of their day so it will be finished in the afternoon for a nice treat. Set your plastic glass in the centre of your bowl filled with your juice, then add the ice all around the outside until the ice covers at least 3/4 up the side of the glass. Carefully sprinkle salt on the ice. Be very careful not to get any salt in the juice. This is very important! But liberally cover the ice with salt. Now wait. And wait. Then wait some more. 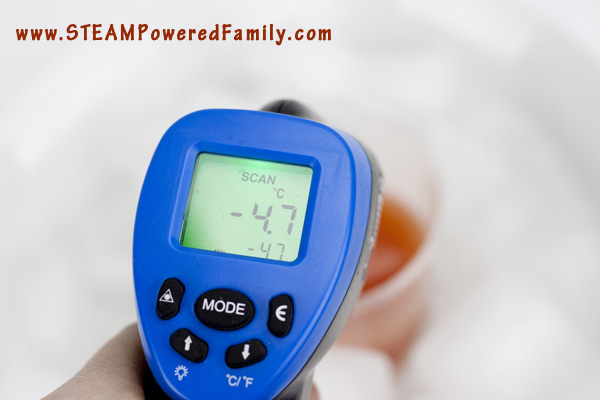 To help pass the time, take regular readings with a non-contact digital infrared thermometer and discuss what is happening. Also study what is happening to the ice cubes. It is quite interesting to watch the way they break down from the ice. Stir the juice gently every 30 minutes. 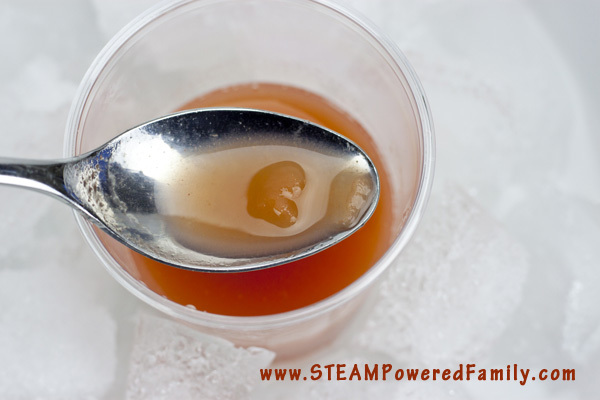 It can take anywhere from 1 to 2 hours for the freezing to start, but once it does start stirring regularly or it will form into an ice cube. We made that mistake once! 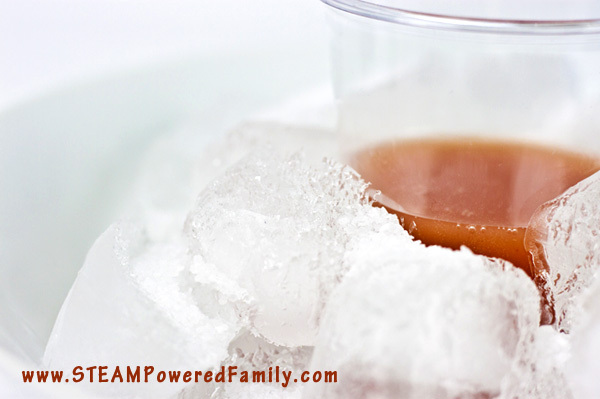 Make sure you scrape the freezing juice off the sides of the glass and mix it all together. Your slurpee will continue to thicken up and once it reaches the desired thickness (we could stand the spoon up in ours! ), it is ready to drink. 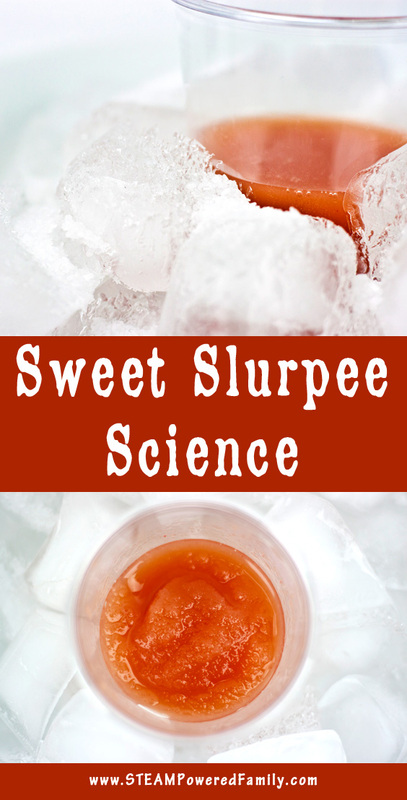 Add a straw and enjoy your sweet slurpee science! In this experiment we are applying the principles of heat transfer and the effect of salt on ice that we learned in our Salt and Ice STEM Activity. In a nutshell, the salt causes an endothermic reaction that pulls heat from around it to melt the ice. It does this so aggressively that it will drop the temperature around it below freezing which allows our drink to go below freezing. We registered a low of almost -5C and it stayed at that temperature for a couple of hours without warming up. This allowed our juice to freeze. Then as long as we remembered to stir and break up those ice crystals so it didn’t form a block of ice, the result is a wondeful slushie slurpee. 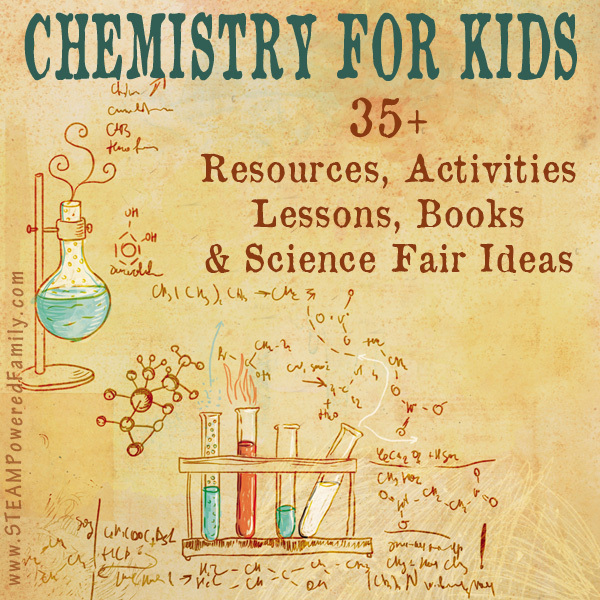 Check out Winter STEM Activity for more details on the science.